Padmabushan Dr. K.V. AL. RM. Alagappa Chettiar, (April 6, 1909 - April 5, 1957), was an Indian businessman and philanthropist. Dr. RM. Alagappa Chettiar was born in Kottaiyur in the Sivaganga District of Tamil Nadu to K.V.AL. Ramanathan Chettiar and Umayal Achi. He attended Presidency College at Chennai, where he became friendly with Sarvepalli Radhakrishnan, a model teacher who later on became President of India. In 1930 at the age of 21 he was the first M.A. (English Language and Literature) from the community of Nattukottai Nagarathars. After his graduation he went to England to pursue the study of Law. He qualified for the Bar at Middle Temple in England and became a ' Bar-at-Law ' to be cherished by the people of Chettinad. Adventurous by nature he was awarded a pilot certificate at Croydon, London. During this time he became the first Indian trainee in the Chartered Bank, London. He harboured a firm conviction that education is an absolute must for a human being to become productive, wholesome and humane. In 1943 he donated one lakh (100,000) rupees for the installation and development of the Tamil Department of Travancore University. In 1947 at the Dr.Annie Besant centenary celebrations he answered the call for industrialists to help educate India by spontaneously offering to start an Arts College in Karaikudi. This college, Alagappa Arts College started at Gandhi Maleghai, opened three days later. His generous donations led to the establishment of a string of educational institutions, which formed the basis for the foundation of the Alagappa University in 1985 by the Government of Tamil Nadu. He convinced Prime Minister Nehru to house one of the Government's National Research Institutes in the heart of the Alagappa campus. As Dr. Radhakrishnan, the Vice President of India surmised at the opening of the Central Electro Chemical Research Institute (CECRI) on 14 Jan 1953. " The magnificent gift of 300 acres (1.2 km2) of land and fifteen lakhs (1.5 million) of rupees by Dr. Alagappa Chettiar helped the Government of India to select Karaikudi as the seat of Electro Chemical Research Institute. Being a businessman himself, Dr. Alagappa Chettiar is aware of the industrial possibilities of our country and the need for scientific, technical and technological education. In his lifetime he has built a monument for himself and you have only to look around. " Dr. Alagappa Chettiar pioneered the centre of excellence "A.C.College of Technology" (named after him) at Guindy, Chennai, which offers specialised Engineering & Technology courses including Chemical Technology, Petroleum Refining & Petrochemicals, Textile Engineering, Leather Technology, Industrial Biotechnology, Ceramic Technology, Pharmaceutical Technology, Food Technology, etc. Presently it comes under the governance of Anna University. His crowning piece of philanthropy was giving away his own palatial residence in Kottaiyur to found a women's college. Avichi Meiyappa Chettiar (28 July 1907 – 12 August 1979), also known as A. V. Meiyappan or AVM was an Indian film producer, director and philanthropist who established the AVM Productions in Vadapalani, Chennai. He is widely regarded as one of the pioneers of Tamil cinema, and one of three movie moguls of the South Indian film industry along with S. S. Vasan and L. V. Prasad. His production company AVM Productions is the only production company in Kollywood (Tamil film industry) to run successfully for five decades and three generations. AVM was born in Karaikudi in a well-to-do Nagarathar family. He moved to Chennai (then known as Madras) at an early age and established Saraswathi Stores which sold gramophone records. Subsequently, he entered the film industry and started directing his own films. After some initial setbacks, AVM delivered a string of hits in the early 1940s. Following the immense success of his 1947 film Nam Iruvar, AVM moved to film production and established AVM Productions in Chennai, first at Santhome and then at Kodambakkam. In 1951, AVM entered the Hindi film industry with the film Bahar starring Vyjayanthimala. By the time he died in 1979, he had produced 167 films. Some of the greatest hits produced by AVM Productions are Vazhkai, Bahar, Parasakthi, Hum Panchi Ek Dal Ke, Bhookailash, Kalathur Kannamma, Server Sundaram and Major Chandrakanth. AVM also directed a number of films in the 1930s and 1940s, the notable ones being Alli Arjuna, Bhookailash, Sabapathy, Sri Valli and Nam Iruvar. karaikudi Mani karaikudi Mani was born on September 11, 1945 at Karaikudi, Tamil Nadu. He is the son of Late Sri.T. Ramanatha Iyer and Smt. Pattammal. He stepped into Carnatic Music at the age of 3. Although he commenced with Vocal training, very soon he realised his special interest was in Percussion and switched over to the Mridangam. His Gurus were Karaikudi Sri Rangu Iyengar, Sri T R Harihara Sharma and Sri K M Vaidyanathan. His first stage performance took place when he was 8 years old at Karaikudi. Thereafter he developed the Karakudi Mani Bhani (Style), which won the hearts of many young percussionists and others all over the World and has earned him the status of being a trend-setter in the field of Mridangam. “Master Mani” as he is now known, was soon performing regularly. He was growing up in what is now hailed as the Golden era of music. It was the time when the Great father of Mridangam, Sri Palghat Mani Iyer was in his prime. Mani professes immense admiration for the veteran Mridangist. In his early days, Mani idolised the great Palghat Mani Iyer, and soon became noticed by the Mridangam giant himself. Mani proclaims one of his greatest accolades to be the instance when Sri Palghat Mani Iyer praised Mani in a public concert. Master Mani was soon making a mark in Carnatic world through his natural born flair and devotion to music. He commenced tutelage under Sri Haihara Sharma after moving to Chennai. Master Mani received his first national award from the then President of India, Dr Radhakrishnan at the age of 18. For the next four decades, he declined scores of prestigious awards that were offered to him, until 1999 when he accepted the national award from "Sangeeth Natak Academy". This was presented by the President of India at the time, Mr K.R. Narayanan. As a teenage musician he performed with the likes of D K Pattammal, Semmangudi Srinivasa Iyer,Lalgudi G Jayaraman,Dr. M BalamuraliKrishna, Madurai Somu, Chembai Vaidhyanatha Bagavathar, T. R. Mahalingam, Voleti Venkateshwarulu, M D Ramanathan, and M.S.Subbulakshmi, to mention a few. Chidambaram Palaniappan (Tamil: ப. சிதம்பரம்; born 16 September 1945) is an Indian politician with the Indian National Congress and the current Union Minister of Home Affairs of the Republic of India. Previously he was the Finance Minister of India from May 2004 to November 2008. However, after the resignation of Shivraj Patil, Chidambaram was made the Home Affairs Minister. 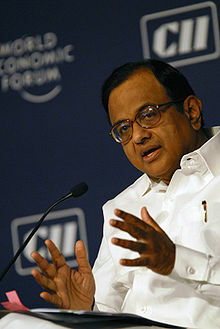 Chidambaram was born to Kandanur(near karaikudi) L. Ct. L. Palaniyappa Chettiar and Mrs. Lakshmi Achi in Kanadukathan in the Sivaganga District, in the state of Tamil Nadu, India. He was born into the royal family of Chettinad. Chidambaram did his schooling from the Madras Christian College Hr.Sec.School, Chennai. After graduating with a Bachelor of Science (B.Sc.) degree in Statistics from The Presidency College, Chennai, he completed his Bachelor of Laws (LL.B.) from the Madras Law College currently Dr. Ambedkar Government Law College, Chennai, and his Masters in Business Administration (M.B.A.) from Harvard Business School class of 1968. He also holds a Masters from Loyola College, Chennai. Without Chidambaram, No Pallavan, No Tiruchi by-pass. Nacha, please update our P.CT profile.Now he is again Finance minister.